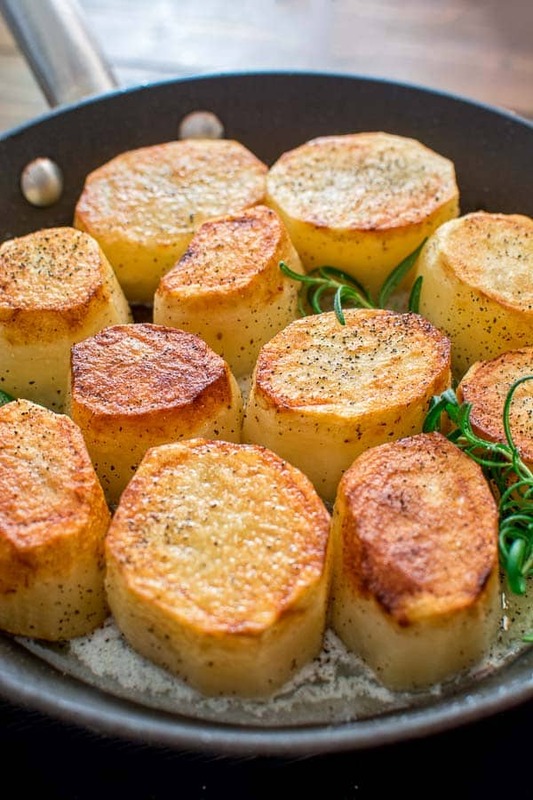 Crispy on the outside, tender and creamy on the inside, cooked with butter and a hint of garlic, these Rosemary Fondant Potatoes make simple yet elegant side dish! Is there a better flavor combination than rosemary, garlic and butter? 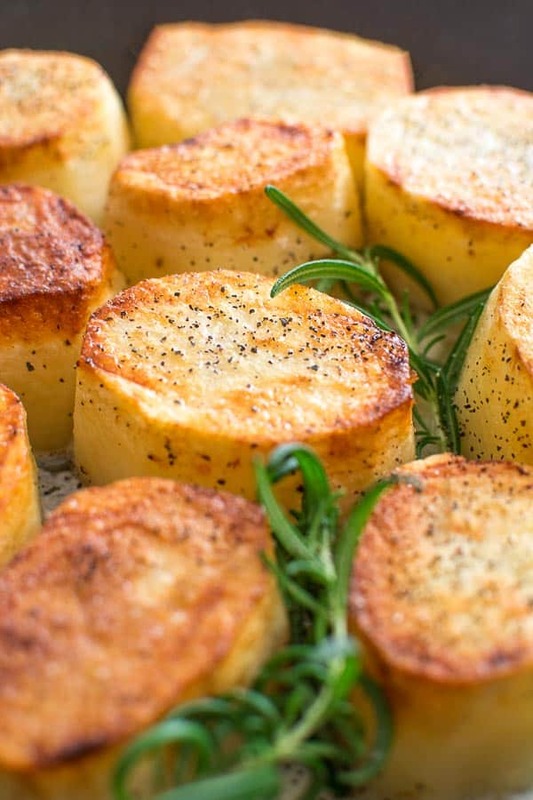 And don’t even get me started on the aroma… These Rosemary Fondant Potatoes look good, but taste even better! All of your family will love this recipe! You don’t need a lot of fancy ingredients to make these fondant potatoes. You probably have everything on hand as you are reading this. OK, maybe you are missing fresh rosemary at this point, but it is sold in most grocery stores, so, it is not hard to get. I actually have rosemary growing in my backyard. 🙂 It is easy to grow it and I always have it handy. I also grow thyme, basil and mint. Fondant potatoes, is a French dish. The recipe traditionally involves cutting potatoes into cylinders, browning them on both ends, and then slowly roasting them in the oven together with butter and stock. WHAT KIND OF POTATOES WORKS BEST? Good question. Although you can make these with any potato, I found the russet, Idaho, and baking potatoes yield the best results. 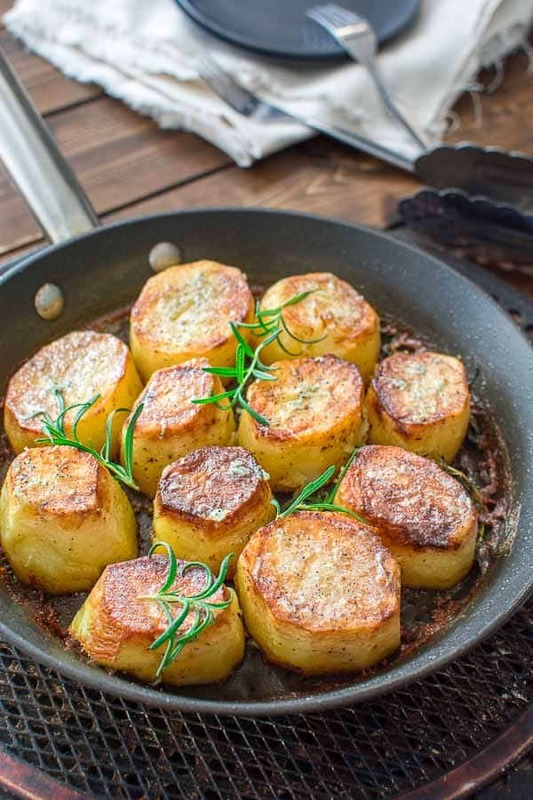 HOW TO MAKE ROSEMARY FONDANT POTATOES? The trick to making these Fancy Potatoes perfect is cutting them right. I always try to find potatoes that are similar in size for this recipe. Once the potato is peeled, it needs to be cut into 1 or 1 1/2 inches pieces. After that, fry the potatoes in a small amount of oil to develop a crust, and then continue cooking them in butter and rosemary. Then you’ll bake them in the oven with some chicken or vegetable broth. Once the potatoes are ready, I rub them with minced garlic and some extra butter. 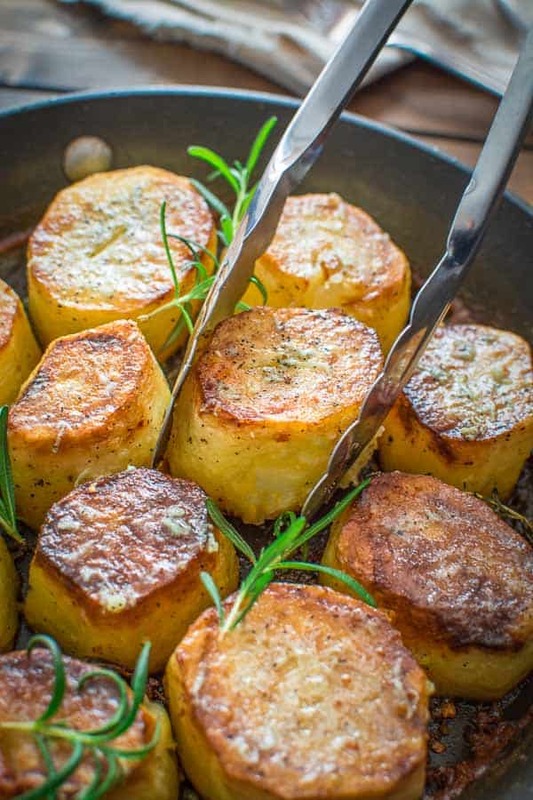 These Rosemary Fondant Potatoes could be served with fish, steak, steamed veggies or a simple garden salad. My husband enjoys them the most with this Easy Mushroom Sauce. Whatever you choose to serve it with, I am confident you’ll find yourself craving more! Bake for about 20-30 minutes, until the potatoes are cooked through. (Pierce one of the potatoes with a toothpick or a knife to check if they are cooked). Garnish the potatoes with fresh rosemary springs, rub with minced garlic and cool slightly before serving. Enjoy! I like so much baked potatoes. I could eat them without nothing else. But these flavors garlic and rosemary makes them so, so much better and really delicious. I’m making these now. I didn’t have Rosemary so I just used some Herbs de Provence and bacon fat instead of butter and oil. They just went in the oven and we are going to have along with some Brockwurst for dinner…. What a great idea to serve these with Brockwurst! Enjoy! Can these be made ahead and warmed up before serving? When do you add the garlic? It is not stated in the directions! oh. my. word. these look amazingly elegant and remind me of a nicoise salad i had a few weeks back in minneapolis that was served on top of beautiful potatoes like these!! *rushes to recreate at home using your recipe* thank you!!! And they taste good too, Maria! 🙂 Let me know how you enjoyed them! Rosemary, Garlic & Butter are one of my favourite flavour combinations so I know this will be a hit! Thanks for the recipe! Hope you’ll give it a try, Whitney! These potatoes look absolutely perfect. Pinned to try! I appreciate the pin, Jill! That crust on those potatoes looks dynamite! Garlic and rosemary on potatoes truly make the seem so fancy. Thank you, Jamie! Garlic and Rosemary are perfect together!